(Nanowerk News) Lensless microscopy with X-rays, or coherent diffractive imaging, is a promising approach. It allows researchers to analyse complex three-dimensional structures, which frequently exist in nature, from a dynamic perspective. Whilst two-dimensional images can already be generated quickly and in an efficient manner, creating 3D images still presents a challenge. Generally, three-dimensional images of an object are computed from hundreds of individual images. This takes a significant amount of time, as well as large amounts of data and high radiation values. A team of researchers from Leibniz University Hannover and other universities has now succeeded in accelerating this process considerably. The researchers developed a method in which two images of an object can be taken from two different directions using a single laser pulse. The images are then combined to form a spatial image – similar to the human brain forming a stereo image from two slightly different images of both eyes (Nature Photonics, "Computed stereo lensless X-ray imaging"). The method of computer-assisted stereoscopic vision is already used in the fields of machine vision and robotics. 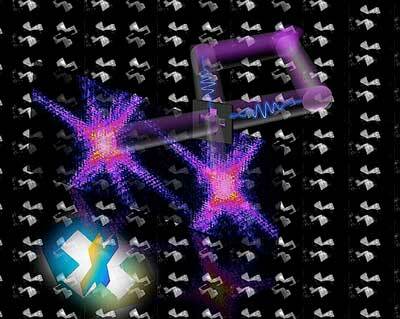 Now researchers have used the method in X-ray imaging for the first time.